United States. North is at top. 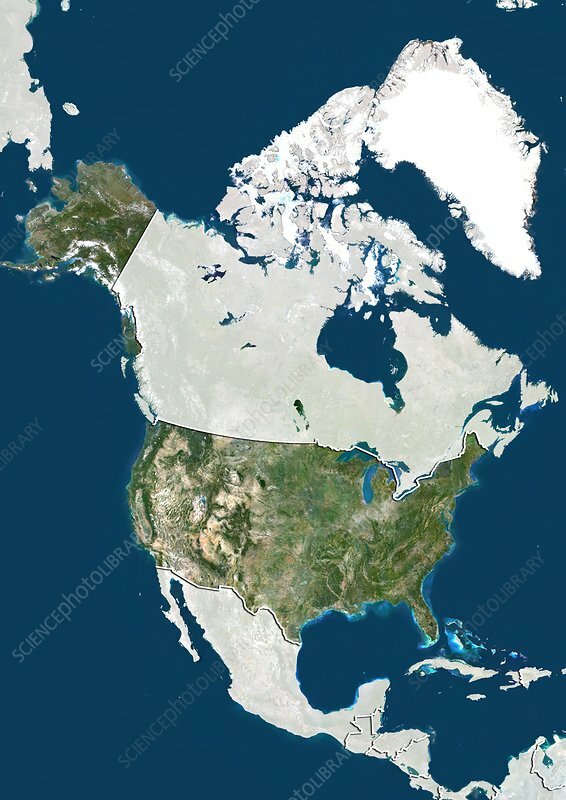 Satellite image showing the United States of America with the surrounding territories shaded out. The USA consists of 50 states. North America (green, lower centre), with the other two being Alaska (green, upper left) and Hawaii (not shown). It is bordered by Canada (upper centre) and Mexico (bottom centre). Greenland (top right), the Pacific Ocean (blue, left), Atlantic Ocean (blue, right) and the Caribbean Sea (blue, bottom right) can also be seen. Image compiled from data acquired by LANDSAT satellites, in 2012.